Trotec Laser Online Magazine: CorelDraw: Creating a Cutting Path from an Image. 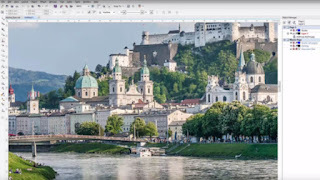 CorelDraw: Creating a Cutting Path from an Image. Do you still have some confusion about CorelDRAW? Take a look at this quick tutorial on creating a cutting path from an image. When selecting the photograph, please pay attention to the resolution. For very detailed graphics, we recommend using high-resolution images; otherwise, the appearance might become blurred and pixelated upon zooming in. After that, start drawing the outline of your city with the pen tool. Initially, draw all lines as straight lines. The individual segments can be converted into curves and matched to the rounding of the pattern.